American Windmills is dedicated to the preservation, restoration and sale of the Old Farm Style Water Pumping Windmill and Hand Pump systems. We specialize in the AERMOTOR Windmills with a rebuilt motor that has oil seals and roller bearings. 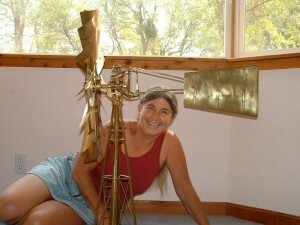 THIS Aermotor windmill is the BEST motor you will find on the market. My Aermotor will start up in the slightest PUFF of wind. From the outside, the windmill blades and tail will look like it’s been up at your place for years, but the motor guts and the internal spinning parts will be brand new. Since you can’t see these parts, it will LOOK old with a beautiful patina. Most of these Windmills come from California where there isn’t ANY rust. We put a FULL 12 year warranty on these windmills. ***If you don’t get a response from an e-mail you’ve sent, it doesn’t hurt to follow up with a phone call. My e-mails have been sketchy, at best. My Spam filter is WAY too unkind! We have new AERMOTOR windmills and towers. Give me a shot at pricing the new one. My “new” prices are cheaper than purchasing from the factory. I guarantee it. We carry Handpumps, which are now on sale, towers, pump cylinders, pump rod, adapters, replacement parts and manuals with parts diagrams for Baker Monitor Windmills, Dempster Windmills, and AERMOTOR Windmills. Do you need a manual for a windmill you have? Send me an e-mail with the make and model number on the gear box. AERATORS which are now on sale too! Do you need wood tower plans? I have them for a 25′ tower up to 47′ for $100. This will include the informational packet, a $35 value. Send me an e-mail and ask. I’m chock full of knowledge about the water pumping system. This IS your ONE STOP Windmill Store! We also have a machine shop dedicated to making hard to find Windmill and hand pump parts! Please take a minute to Bookmark this site. Click on this picture for a larger view of Paul and Ellen! “Garden toy” miniature windmills and pumps from $55 to $205 including the shipping to your door. 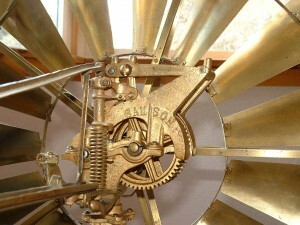 Beautiful Rebuilt Original Chicago AERMOTOR Windmills from $3450 including a 12 year warranty. These windmills have the top of the line gear boxes. Paul and Ron have come up with an oil seal, roller bearing model that not only will turn on the slightest puff of wind (3 MPH), AND they are guaranteed NOT to leak for 10 years. I even have a gearbox that doesn’t require oil if you’re not going to pump. If you’re tired of maintenance or oil on the tower, look into this windmill. These windmills have the original blades and tails. They’re aren’t ANY prettier windmills and towers anywhere with the authentic parts AND warranty. I have pumpers or future pumpers, spinners or non spinners…let me know what you would like on YOUR property. I can even rebuild YOUR windmill with these oil seals and roller bearings. DON’T just rebuild it, make it better. Send me an e-mail today. You NEED to see the new 6′ windmill on a redwood tower that stands 19′ tall and costs $3650! THIS IS A GREAT DEAL! 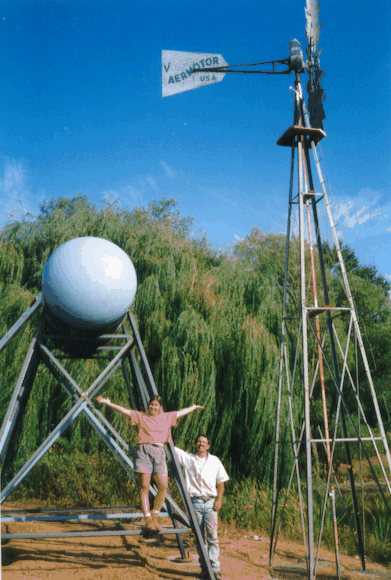 5′ Diameter, 12 blade Windmills and towers from $900 including the shipping! The aerators are now on sale. Did you see my redwood tank page? I have the prettiest redwood tanks…some old and some new. It’s the old growth heart redwood that you don’t find anymore. I have a 10,000 gallon redwood tank right now. Interested? Send me an e-mail. If you want to see what we sell, go to the SALES PAGE…or continue looking through this home page. Look on my sales page for more information, or click here! 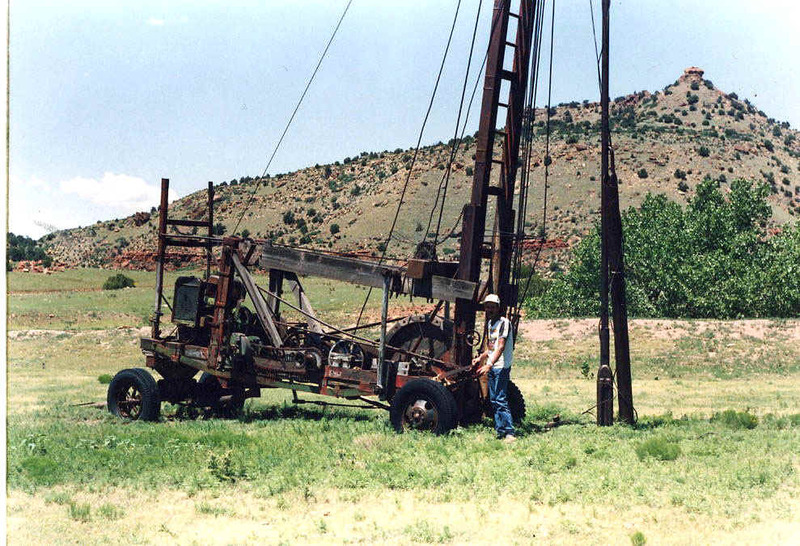 Did you know that a hand pump system can fit inside a 2″ well case and pump up to 300 feet? 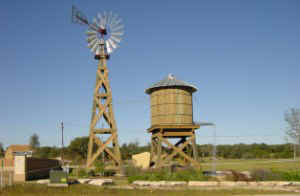 Hand pumps and windmills can pump above the well head. Give me a well situation and I’ll get you a hand pump system! Remember that the 10th anniversary is the TIN anniversary. THINK WINDMILLS! You need to go to my Windmill Specials Page for bargains! 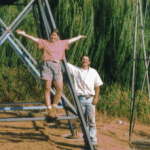 Click this “NEW” Windmill Stuff Page link. I added a page called Windmillers’ Hints. 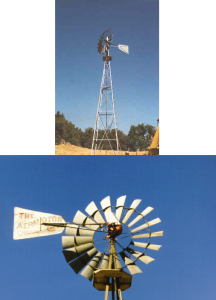 If you need to install a Windmill, tower or hand pump system, or any part of a system, then look at my How to install the Windmill, Tower and Hand Pump page. This is full of great hints! 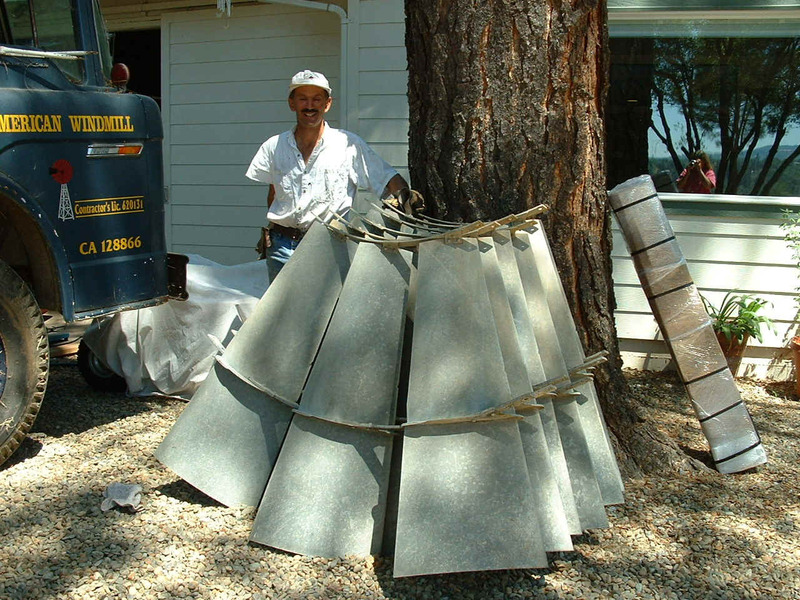 Check out Paul with these beautiful windmill blades for a 12′ windmill. We have 2 acres of the prettiest double dipped galvanized blades and tails. Click on the picture for a larger image. Charlie sent me this picture of a drilling rig too. Click on it to see it better. On my Sales Page you’ll find a list of the windmill products I sell. There are many links from the Sales page to other pages. You’ve got to see the pictures on the Company Information Page. Here’s what the wood rod and guides will look like inside your windmill tower! Notice the AERMOTOR ladder loops on the corner post. Have you ever heard of a Salesman Sample Windmill? I got one for my birthday and here’s a picture of it. It’s an exact replica of the real thing, down to the small nuts and bolts, in 25% miniature. Very cool, very rare. It’s an open geared Samson Windmill made in Freeport Illinois by the Stover Manufacturing Company.